Outpops other leading air poppers. Pops with hot air, not oil, for a delicious low-fat treat. 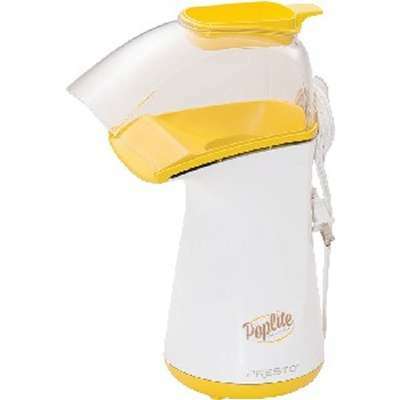 The PopLite hot air popper uses regular or gourmet popcorn with virtually no unpopped kernels. It's faster, healthier, and more economical than most microwave bag popcorn. It pops fast--up to 18 cups of gourmet corn in less than 2 1/2 minutes. Hot air popcorn is all natural with no artificial flavors or added salt and zero grams of saturated fat per serving. PopLite outpops other leading hot air poppers. Dozens of comparative tests prove that it makes more popped corn with virtually no unpopped kernels. The chute directs popcorn into your bowl. The measuring cup doubles as a handy butter melter. Cleanup is easy! It pops without oil, so the base and cover simply wipe clean. A built-in cord wrap provides convenient storage.